Director – Jack Sholder, Screenplay – Bob Hunt [Jim Kouf], Producers – Kouf, Michael Meltzer & Robert Shaye, Photography – Jacques Haitkin, Music – Michael Convertino, Visual Effects – Dream Quest Images (Supervisor – Justin Klarenbeck), Special Effects Supervisor – Gregory C. Landerer, Makeup Effects – Kevin Yagher, Production Design – C.J. & Mick Strawn. Production Company – New Line Cinema/Heron Communications/Mega Entertainment. Police detective Tom Beck investigates as a stockbroker with no previous criminal record robs a bank and shoots several people. The man is badly injured in a high-speed car chase and then dies in hospital. Beck is joined by FBI agent Lloyd Gallagher who develops interest as the man in the bed next to the stockbroker then gets up, steals rock music and a Ferrari and goes on an identical crime spree. A massive onslaught of gunfire is needed before the man can be stopped – and immediately after he is killed, another completely unrelated person with no previous criminal record takes up on an identical crime spree. Along with the mysterious Gallagher, who is not being entirely truthful about who he is, Beck discovers that what they are hunting is a parasitic alien lifeform that is capable of passing from one body to another. The Hidden was a modest sleeper hit when it came out. It is like a conceptual combination of The Terminator (1984) and The Brain from Planet Arous (1957) and, as some have noted, with more than a few passing resemblances to Hal Clement’s novel Needle (1949). Just as equally the film can be seen as a response to Lethal Weapon (1987), which was released seven months earlier the same year. Lethal Weapon paired a curmudgeonly human cop with a mentally unstable Mel Gibson and played the interaction for comedy value. A number of films over the next few years offered up similar bizarre and wacky buddy cop pairings. The Hidden substitutes an alien for Mel Gibson but essentially riffs on the same basic idea. The central idea remains sketchy but is drawn out with enough ingenuity to make The Hidden one of the most unusual cops’n’robber chase movies ever. There is no underlying message or pretensions towards profundity, rather director Jack Sholder concentrates on grittily satisfying action. It is all aided by an amusingly adept sense of tongue-in-cheek humour. 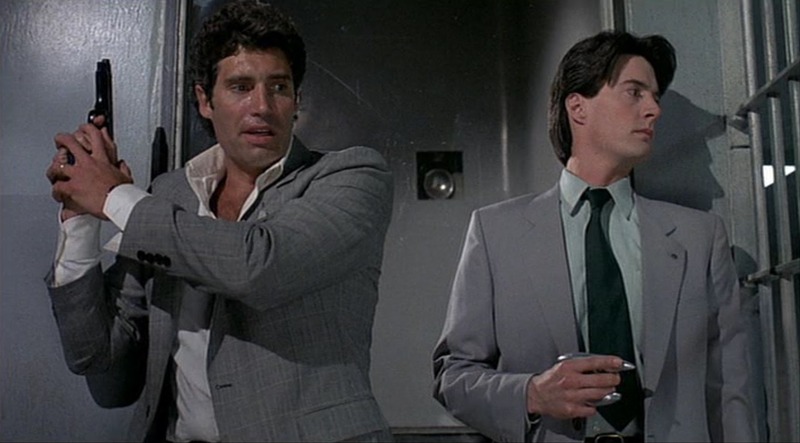 Michael Nouri adds a handsome charm and Kyle MacLachlan brings the immaculately polished weirdness that had him cast in an identical FBI agent role in tv’s Twin Peaks (1989-91), and the pairing of the two is a charming Odd Couple variation on the buddy cop cliche. 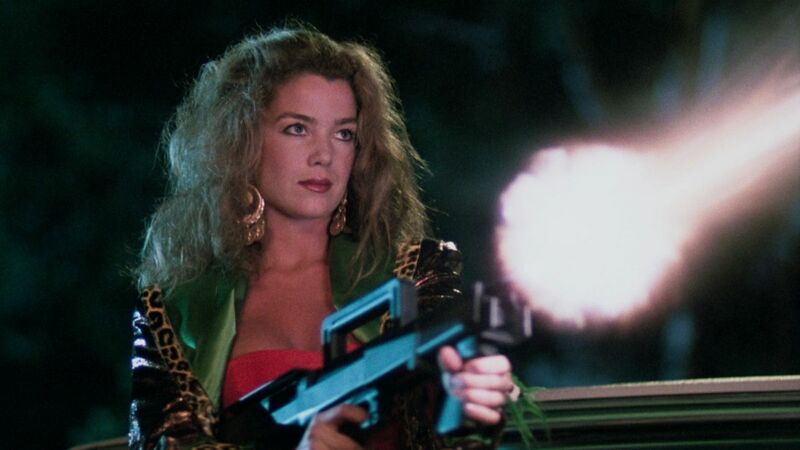 The Hidden also introduced actress Claudia Christian to the world, who went onto become a minor genre queen, most notably as a regular on tv’s Babylon 5 (1993-8) who owns much of the middle of the show. The only letdown is the maudlin ending. The success of The Hidden resulted in a small spate of science-fiction films featuring cops tackling body-hopping aliens, including the likes of the tv mini-series Something is Out There (1988) and the films Peacemaker (1990), the Hong Kong-made The Cat (1992) and Monolith (1994). This was then followed by a spate of body-hopping demon films including The First Power (1990), Fallen (1998), The Minion/Fallen Knight (1998) and Guardian (2000). The Hidden II (1994) was a disappointingly poor sequel. Director Jack Sholder had previously premiered with the slasher film Alone in the Dark (1982) and then made the lame A Nightmare on Elm Street Part II: Freddy’s Revenge (1985). The Hidden would be the peak in Sholder’s career and he has subsequently gone onto undistinguished tv movies such as the nuclear war film By Dawn’s Early Light (1990), the timeloop film 12:01 (1993), the cloning film Natural Selection/Dark Reflection (1994), the unsold series pilot Generation X (1995) from the superhero comic-book and 12 Days of Terror (2004) about a killer shark – and then the direct-to-video horror sequel – Wishmaster 2: Evil Never Dies (1999) and the monster movie Arachnid (2001). Sholder was also responsible for directing uncredited additional footage on the problem-ridden Supernova (2000).